Barrupu Yunupingu grew up at Yirrkala, attending the mission school. She trained and worked as a nurse at the Yirrkala clinic until its closure in 1975. When the Yirrkala printspace was commissioned she was one of the first women to complete works. Her works were included in the Printmakers first exhibition in Yirrkala in 1998 and she continues to produce works through this organisation. 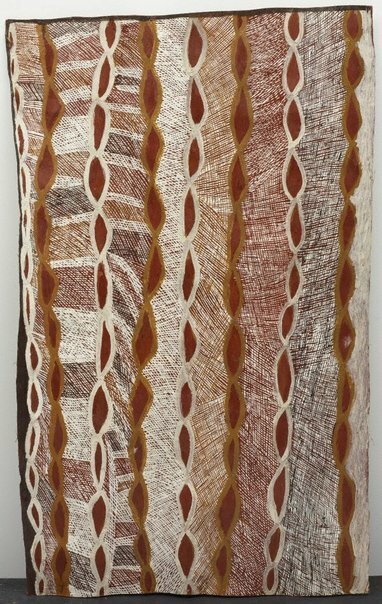 In 2007 Barrupu began producing more bark paintings and following the success of her closest sister, Nyapanyapa, at her 2008 exhibition with Roslyn Oxley9 Gallery, Barrupu developed her signature style and began producing larger works. This painting was included in the National Aboriginal and Torres Strait Islander Art Award, Darwin 2009.